Florida school shooting victims: These are the names to remember. There were 17 victims in the Florida school shooting. These are their faces and stories. Alyssa was just 14 and played soccer for Parkland Travel Soccer. Her mother told HLN her last words to her daughter were "I love you" as she dropped her off at school on the morning of the shooting. "Alyssa was a beautiful, smart, talented, successful, awesome, amazing soccer player. You&apos;ll be greatly missed, Alyssa. We love you so much. You&apos;ll always, always be in our hearts." Student Kelsey Friend told Good Morning America 35-year-old geography teacher Scott Beigel had only been at the school a year when he saw a group of students running to him. He let them into his classroom as a means of hiding from the roaming gunman. While he was trying to lock the door, he lost his life. “I am alive today because of him,” Friend told Good Morning America. Beigel was also a counselor at Camp Starlight in Pennsylvania. In a Facebook post, the organisation called him"friend and hero". Fourteen-year-old Martin Duque Anguiano was a freshman at Marjory Stoneman Douglas High School. On Instagram, his brother Miguel wrote "words can not describe [his] pain". "I love brother Martin you&apos;ll be missed buddy. I know you&apos;re in a better place. Duques forever man I love you junior!!! R.I.P Martin Duque!" He has also since created a GoFundMe fundraiser, to cover expenses of his funeral. Nicholas Dworet was an aspiring Olympic swimmer and a “charismatic young man”, a family friend told TIME Magazine. Nicholas Dworet was due to turn 18 next month. Aaron Feis was the football coach, security guard and "proud alumnus" of Stoneman Douglas, NBC reports. "It is with Great sadness that our Football Family has learned about the death of Aaron Feis. He was our Assistant Football Coach and security guard," Marjory Stoneman football said on Twitter. "He selflessly shielded students from the shooter when he was shot. He died a hero and he will forever be in our hearts and memories." Broward County Sheriff Scott Israel said he knew Mr Feis - who is reportedly survived by his wife and daughter - personally. "I coached with him, my two boys played for him. I don&apos;t know when Aaron&apos;s funeral is, I don&apos;t know how many adults will go, but you&apos;ll get 2,000 kids there. The kids in this community loved him. They adored him. He was one of the greatest people I knew. He was a phenomenal man." In an open letter to America pleading for gun control, Jaime&apos;s aunt Abbie Youkilis said her neice had the "world&apos;s best smile". "She was a pretty girl with the world’s best smile and her soul was sensitive and compassionate. She was intelligent and feisty and she danced with beauty and grace. She always looked out for the underdog and the bullied and she probably had been kind to the student who shot her. She planned to grow up and become a mommy and an occupational therapist." Chris Hixon was the athletic director and wrestling coach at the high school and is survived by his wife, Debra, and his son. "Every one of those students he thought of as his own kid," Debra told CNN. A Naval reservist, Hixon was deployed to Iraq in 2007. According to People, Luke was a “happy-go-lucky kid” who loved basketball and eating McDonald’s Chicken McNuggets and macaroni and cheese. She went on to say because his older brother and sister no longer live at home, he was "very close" to his mother because "it was just the two of them all of the time." Cara, a dancer, was mourned by a neighbour on Facebook: “It is with a heavy heart and much regret that I write these words. Our next-door neighbour’s daughter was one of the lives taken to soon by a senseless act of violence at Stoneman Douglas High School." Her dance studio, the Drake School of Irish Dance, also posted a tribute on Facebook. "Cara was a beautiful soul and always had a smile on her face," the studio wrote. "We are heartbroken as we send our love and support to her family during this horrible time." 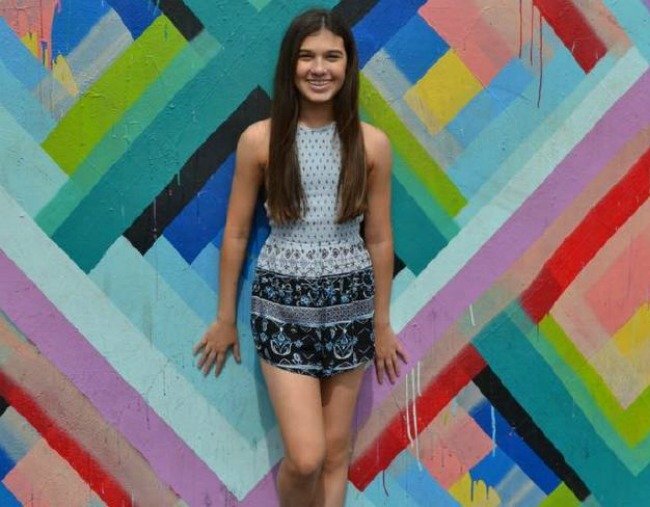 Gina, a member of the school&apos;s marching band, was remembered by one of her instructors who told the Miami Herald Gina "was the sweetest soul ever". “She was a smart, loving, caring and strong girl who brightened any room she entered,” her mother said on Facebook. Born in Venezuela, Joaquin became an American citizen in January 2017 after moving to the States at the age of three. According to the Sun-Sentinel, he loved football, basketball, the Venezuelan national soccer team, urban graffiti and hip-hop. On January 1, he posted a message on Instagram to his girlfriend Victoria Gonzalez - his final post on the platform. "Thank you Lord for putting a greater blessing than I could ever imagine into my life this past year," he wrote. "I love you with all my heart." Alaina Petty was a member of the Mormon congregation based in Coral Springs. "While we will not have the opportunity to watch her grow up and become the amazing woman we know she would become, we are keeping an eternal perspective," they added. CNN also report she was a member of a leadership program at her school taught by retired Army personnel. Meadow Pollack was planning to go to Lynn University in Florida next year, her father Andrew told The New York Times. “She was just unbelievable,” he said. “She was a very strong-willed young girl who had everything going for her. According to her relative Curtis Page, Helena Ramsay was kind and thoughtful. “Though she was somewhat reserved, she had a relentless motivation towards her academic studies, and her soft warm demeanor brought the best out in all who knew her,” he wrote on Facebook. A GoFundMe page has already been set up by Alex&apos;s family, who intend to create a scholarship in his name. "As a freshman, Alex loved the marching band and played the trombone and baritone as part of the Eagle Regiment band - one of the top marching bands in the state of Florida! He is survived by his heartbroken parents, three siblings, grandparents and countless cousins, aunts, uncles and friends," the page reads. "In an effort to continue his memory, this scholarship is being created to help other students experience the joys of music as well as fund increased security at schools. Please help keep Alex’s spirit alive." Carmen&apos;s cousin, Matt Brandow, said in a Facebook post she was the smartest person he ever knew. "I’m in a daze right now. I feel a million emotions," he wrote, detailing her intentions to move to Washington for college. Carmen was also a 2018 National Merit Scholarship semifinalist, meaning she was in the top one per cent of American students academically. "The nationwide pool of semifinalists, representing less than one percent of U.S. high school seniors, includes the highest scoring students in each state taking the 2016 Preliminary SAT/National Merit Scholarship Qualifying Test, which they took as juniors," the scholarship page reads. When Peter&apos;s cousin Aaron first arrived in Florida, Peter worked hard to make sure he wasn&apos;t bullied and felt welcome in his new home. “He was always so nice and so generous,” Aaron, 16, told the New York Times. LISTEN: Amelia Lester explains why US gun laws will never change, no matter how many lives are lost.